Every year during Thanksgiving people eat overexuberant amounts of food and then sit in front of the television and watch football. There are some classic rivalry games with the Redskins traveling to play the Cowboys in Dallas, the Bears visiting the Detroit Lions and the Atlanta Falcons travel to face the Saints. Normally on the Thursday games, the home team has an advantage being that it is a short week for recovery and practice that they do not have to travel. In these rivalry games that is not as much of a factor. 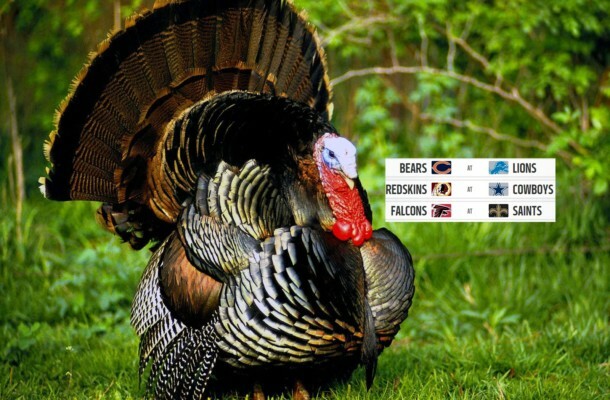 I’m even tempted just to take all moneyline underdogs this Thanksgiving. The line opened at +3 Lions which has moved at most places to +3.5 -120 and the total opened at 45 and has since moved to 44. Short weeks do produce a lot of unders but I would be careful taking an under in Detroit even on a short week. The Bears defense has only been giving up an average of 19.5 points a game and is ranked third overall. Even with the Bears having a tough defense, I’m going to go with the home dog and take the Lions +3 and the best odds I can find. If the total moves to 43 or lower ill hit the over too. THE classic rivalry matchup of all time. The Skins lost their QB Alex Smith last week to a brutal injury. They will be depending on Colt McCoy to lead them at QB against the Cowboys. McCoy looked good last week rallying from behind 17-7 , but then ended up losing 23-21. He is also a pretty fast runner and could be a threat out of the pocket. The Cowboys are not looking bad, in the NFC East they are second place and coming off two big wins against Atlanta and Philly. I think the best bet here is to take the Skins on the spread and moneyline. You are betting on McCoy being able to preform in a big game, and right now you get 7.5 points on the spread in what should be a close low scoring game. The down south rivalry. Damn, the Falcons have not looked great as of late. Any hope of a home game super bowl in Atlanta is going away fast. If there is a game for them to show up for, this is it. They have to face Drew Brees at home though. Expect this one to be like many before, I score, you score, I score more. Who will score more? For me betting on the spread is worthless considering how many points will be on the board for this one, if you want to bet this one take Atlanta moneyline at +514 / 6.14 or the over.